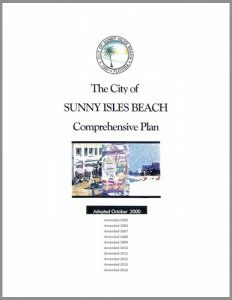 In 2016 the City of Sunny Isles Beach amended its Comprehensive Plan. The Comprehensive Plan is the City’s blueprint for existing and future development. The Plan’s goals, objectives and policies reflect the City’s vision for its future and how it will meet the needs of existing and future residents, visitors and businesses. The City’s original Comprehensive Plan provided the foundation for the dramatic growth and redevelopment that has occurred since incorporation. Moving forward, the Plan has been amended to reflect the redevelopment that has occurred, along with a current vision for moving forward. The first Comprehensive Plan for the City of Sunny Isles Beach was adopted in the year 2000. To view the plan, please submit a public records request with the Office of the City Clerk. Copies may be purchased from the City Clerk for $55.00. Questions regarding the plan should be addressed to the Planning and Zoning Department at 305.792.1710. The City Clerk can be reached at 305.792.1703 or cityclerk@sibfl.net.